America has endured 154 mass shootings so far this year – from Parkland Florida to Annapolis Maryland. Despite this national carnage nothing so far has moved the Pennsylvania state legislature to pass even the most innocuous gun control legislation. Clearly the answer is not lack of opportunity. Scores and scores of gun control measures are routinely introduced into the legislature to no avail. Good old-fashioned interest group politics explains some of the legislature’s paralysis. Pennsylvania is rich with both sportsman and sportsman lobbies. The NRA alone is arguably the most powerful lobby in the state, making gun measures still the third rail of state politics. This year, however, several gun control measures seemed ripe for passage. These were not the perennially divisive bills such as those that would limit the sale of automatic or semi-automatic weapons or seek to restrict hand gun ownership. Instead, they were the product of a broadly bi-partisan consensus that raised only modest controversy. 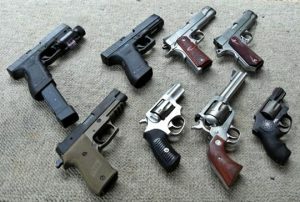 These bills included HB 273 which would allow people to voluntarily put themselves on a no-buy firearm list; and HB 2463 which would create a legal process to reinstate the right to buy firearms to those that temporarily lost that right through emergency involuntary commitment for mental health issues. Among these bills, the one appearing most likely to pass (HB 2060) was designed to stop domestic abusers under PFA orders (Protection from Abuse) from having access to guns. Similar legislation earlier passed the state senate unanimously. In the House, though, some objections were raised because of evidentiary and other due process issues. The belief that PFA orders sometimes were used as malicious strategy in divorce and child custody cases also raised concerns about the bill. House sponsors of the bill ultimately crafted a compromise: If the PFA had included a voluntary consent agreement, the actual surrender of guns would be subject to the discretion of the court. But final passage in the House was not to be. After a compromise amendment was approved overwhelmingly (29-6) by the Appropriations Committee, the House promptly left town for the summer. This failure to adopt this and other non-controversial gun reform bills is blatantly contemptuous of views expressed repeatedly by Pennsylvania’s registered voters. Twice earlier this year the Franklin and Marshall College Poll questioned state voters’ about their views on gun control. A substantial 72 percent of Pennsylvania’s registered voters support additional gun regulations. Enhanced background checks draws strong support from 86 percent of state voters, while 61 percent strongly favor banning assault-style weapons, and a similar majority, 59 percent strongly favors increasing the minimum age to 21 to purchase a gun. Hence this persistent Pennsylvania paradox: the vast majority of the state’s voters support what might be termed “common sense” gun control – yet the legislature fails to act on even the most non-controversial gun control measures. True, sports hunting and target shooting remain vibrant in the state and gun lobbyists exercise enormous influence over the most mundane of gun control measures. But lobby power at best is only a partial explanation for the Pennsylvania paradox. Equally important if not more important are the political party differences revealed by polling data. These party differences on gun control explain why in general more Republican lawmakers than Democrats oppose many gun regulations. Gun ownership heads the list. Overall almost one of every three Pennsylvanian owns a gun (31%). But of the gun owners only one in five Democrats own them (20%) while almost half of Republicans do (46%). This “ownership gap” clearly leads to very different attitudes and opinions about gun control. For example, on the important issue of passing additional laws to regulate gun ownership, huge differences exist between Democratic and Republican voters. More than eight of ten Democrats (86%) favor additional laws but only half of Republicans do (50%). The differences between liberals and conservatives on this issue are stunning. More than nine of ten self-described liberals (93%) advocate more gun regulation while less than four of ten conservatives do (38%). Other demographics show a similar skew. Some 84 percent of those with college degrees support more gun control while only 43 percent of those with high school educations or less do. Similar gaps exist for age as well in other key demographics. The larger story here goes beyond lobby power or even stark demographic differences. Pennsylvanian’s are polarized about gun control along party and ideological grounds – as indeed they are today along so many other issues ranging from health care to taxes to education to minimum wage to immigration … and on and on. This polarization in the electorate helps explain the Pennsylvania paradox on guns as well as the almost total paralysis preventing the legislature from taking even simple measures on gun control. Pennsylvanian’s are deeply divided along party and ideological lines. Once centrists and moderates bridged that gap and brokered the compromises that keeps democracy functioning. But today centrists in both parties have become the road kill of American politics. The Right deplores them; the Left ignores them. But democracy doesn’t work without them. Dr. Madonna is Professor of Public Affairs at Franklin & Marshall College, and Dr. Young is a speaker, pollster, author, and was Professor of Politics and Public Affairs at Penn State University. Madonna and Young encourage responses to the column and can be reached, respectively, at terry.madonna@fandm.edu and drmikelyoung@comcast.net. As much of visionaries that our founding fathers were, I doubt they ever envisioned the number of outright idiots this country. These same idiots believe that any moves to protect the citizenry with laws that will keep guns out of the insane is somehow meant to take their rights away. I don’t think the founding fathers ever envisioned a single person owning 10’s to 100’s of weapons either. I believe their intent was that if threatened, a citizen would have the ability to defend ones self. I don’t think they ever intended any one person to own an arsenal or for lunatic to have access to weapons so they could mow down law abiding citizens or children. Other states have the same partisan divides among their electeds. They bypass them with citizen initiated ballot referendum and initiatives. We in PA are prohibited from doing so. Thus widely popular measures such as those above, redistricting reform, and even medical marijuana for many years are held captive to the whims of the Metcalfe’s and Turzai’s of the state. Medical marijuana enjoyed an incomprehensible 92% public approval and languished in committee and died for countless sessions. We did manage to pull it past our do nothing General Assembly, but that was an extremely rare exception. Want to end the stalemate? Allow citizen initiated ballot referendum and initiatives. The PA State House and Senate as well as our Congress and Senate are fearful of the NRA running a candidate against them in the Primary. Any legislation at any level that attempts to regulate the sale and ownership of firearms is seen as a threat to 2nd Amendment rights, despite what the American Public wants. The government can’t even research the impact or cause of gun deaths, with taxpayer funding, be it suicide or mass shootings or domestic disputes. It is all for the profits of the gun and ammo makers. Background checks, closing the gun show purchase loop hole, sharing mental health records with gun registration departments, banning the sale of firearms from spouses in domestic violence disputes, banning semi-automatic firearms, large capacity ammunition magazines and bump-stocks all seem to me as common sense, not over turning the 2nd Amendment. The seem like gun safety measures, something the NRA used to support. The biggest reason for no gun control in PA isn’t lobbying power. Its that gun owners are motivated and rallied to stop these poor bills. We know they’d have nothing to do with stopping gun crime or mass shootings. We contacted our legislators and let them know we’d hold them accountable if they voted for gun control. America has not endured 154 mass shootings this year. Let’s start with facts. Exactly this. If you want to convince people to solve a problem, the first step is not providing incorrect information. Hi Dan….what is the correct number then? Who has gotten laid more- Charlie O’Neill or Charlie +25, better known as Seth Grove? At least we know Seth’s had a few kids. Did someone ask Wagner at the town hall how he felt having a guy who “thought about joining the Navy” on stage with him? Did Seth treat everyone to the 9.99 Hoss’s special? Does everyone in York county have a beer gut that hangs over their Johnson like Seth Grove? Would Seth Grove be denied insurance because his obesity is a pre-existing condition? Electing Scott Wagner would be furthering the steps noted by Dr. Terry Madonna of distancing the wishes of the voters from what really happens. Wagner fully has embraced the Trump agenda and makes no bones about it. Trump has repeatedly dragged his feet on the gun control issues so if Pa is going to have any chance of gun safety laws coming to pass it is by following the wishes of Pa voters who as of this writing have Gov Tom Wolf ahead by 19 points and this is after Wagner has spent multi millions in the Republican primary. Surely, Wagner will spent more millions but being 19 points down at this point seems to indicate the feelings of the Pa voters towards Wagner and supporting Gov Wolf. The NRA views ANY regulations of guns as unreasonable, and the state legislators are completely unscrupulous whores for the NRA (and also the oil/gas industry, despite all the pollution and spills and contaminated drinking water). Speaking of whores, my whore of an ex-wife does less nagging and whining than you do. Are you aware that the NRA was the organization which crafted the current law for background checks? Maybe if you folks on the left would do some research, stop calling our NRA members terrorists and learned something about firearms, we would then listen to you. Dan F. Please don’t associate comments David makes with us. We can’t vouch for him. Are YOU aware that the 2A was written by our Founding Fathers for White slave owners to keep Black Men down? Maybe if you honkeys on the right would do some research and realize that you’ve been living a lie for over 200 years and understand that the NRA wants the permanent legal authority to shoot and murder Minorties in this Country with no questions asked. So we don’t need to listen to you. That is utterly false. Even the Supreme Court in Dred Scott said that if blacks were citizens, they’d have the right to keep and bear arms. The simple fact is that gun control has an extremely racist history. For example, NC’s pistol permitting law was explicitly written to stop blacks from carrying guns. Legislators said so during debate. Its easy to think about why gun control had a racist history- racists didn’t want minorities to shoot back. We’ve done the research, but you clearly haven’t. The NRA and its members welcome ALL races. Heck, one of their current spokespeople is a black man (Colon Noir)! In the Supreme Court case McDonald vs Chicago that lead to the Second Amendment being applied to the states, the plaintiff (McDonald) was a black man too. So please stop with your falsehoods. If you would do research you find out that the NRA was started to defend black’s from the KKK ,the military arm of the Democratic party. The NRA crafted the loopholes and and hurdles to enforcement in the current laws. They opposed any law/restriction, but when faced with the reality that something was going to get passed, they sabotaged it as best they could. Since then, they’ve still fought it at every turn and tried to repeal/overturn it.